In my eyes, there's no relevant rapper in Hip-Hop today who's more mediocre than Vic Mensa. And by my standards of artistic appreciation, nothing is worse than forgettable. That much was evident last year when Mensa released There's Alot Going On, a cliche-riddled EP that contained the most avoidable typo in the English language in the title. Coming from a supposed soothsayer, someone decrying the actions of modern society while acting holier than it all, failing to spell a word taught in grade school correctly was inexcusable. But I digress. 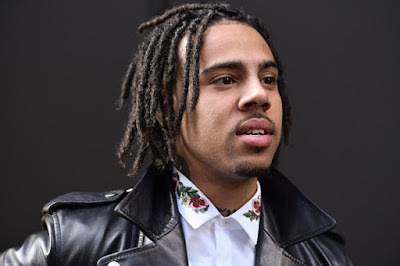 While the Alot blunder swiftly explains Vic Mensa's persona far greater than any write-up could, time needed to be taken with The Manuscript to see if Mensa's corrected his wrongs. Long story short; he hasn't. Supposedly the first of two EP's set for this summer, with an official debut album still looming in the wake, Mensa's made some minor improvements as an emcee, but still comes with baggage that drowns out any growth. The Manuscript, ironically, fairs better than There's Alot Going On because of the fact that these four songs are merely throwaways, not a collection meant to enact social change. They capture Mensa in a never-ending parade of pseudo-struggles and pseudo-successes. Featuring Pusha T and Pharrell Williams on production, 'Omg' feels like a Clipse track, which might be the first time Mensa has imitated an artist who wasn't evidently prominent. The song works, and may be his best yet, although that's not saying much. However, any promise of a changed man quickly evaporates with 'Rolling Like A Stoner,' which is a pitiful song both musically and lyrically. With irritating production that screams dreadful frat party, autotuned yelping, and an announcement that he's somehow antisocial (this is gold to someone who actually is), 'Rolling Like A Stoner' might be one of the worst songs of 2017. Hilariously enough, Mensa proclaiming that he's "got a problem nobody knows" on a song about drug intake immediately reminded me of Danny Brown's 'Ain't It Funny,' and how poorly handled 'Rolling Like A Stoner' is in comparison. Making matters worse, 'Rage' closes out The Manuscript with something I had hoped we could avoid; Mensa and his social commentary. Topics range from depression to technology to drug addiction to police brutality to our government. 'Rage's' blunderbuss only feels necessary as a means to convince listeners that Mensa's troubled, and so is the world. Which, like The Manuscript as a whole, is pretty pathetic.